“The long, rough and glorious history of the Royal Marines has shown that they have achieved much. They will achieve more. They are ready to assail the enemy at many points… They are a formidable and versatile company of warriors as highly trained as any the world has seen.” Winston Churchill. This year the Royal Marines celebrate their 350th Anniversary. From fighting on the decksand in the mastheads at the Battle of Trafalgar, through two World Wars, to the modern dayleading the assaults on the Falkland Islands and Iraq and operating in Afghanistan, they are an integral part of Britain’s defence and the Royal Navy; their distinction combines excellence, versatility and unique amphibious skills. Formed in the reign of King Charles II on 28 October 1664 as the Duke of York and Albany’s Maritime Regiment of Foot, the name Marines first appeared in the records in 1672 and in 1802 they were titled the Royal Marines by King George III. The Marines have taken part in more battles on land and sea around the world than any other branch of the British Armed Forces, often fighting beside the British Army. Today, the Royal Marines are the UK’s Commando Forces and the Royal Navy’s amphibious troops. An elite force held at very high readiness, they are trained for worldwide rapid response, able to deal with a wide spectrum of threats and security challenges. The Duke of York and Albany's Maritime Regiment of Foot (20p). Theearliest precursors of the Royal Marines are shown aboard a Man-of-War. 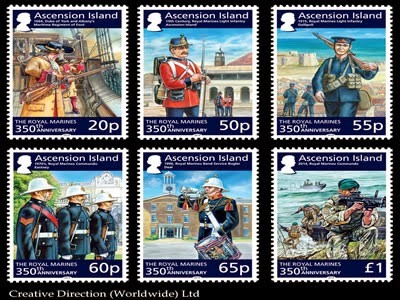 19thCentury Royal Marines Light Infantry – Ascension Island (50p). The old Royal Marines Barracks in Georgetown, now the Exiles Building, can be seen in the background. 1915, Royal Marines Light Infantry – Gallipoli (55p). Five Royal Marines earned the Victoria Cross in the First World War, one being at Gallipoli. 1970’s Royal Marines Commando – Eastney (60p). Built in the 1860’s Eastney became the HQ for all Royal Marines Hampshire establishments in 1947 and finally Headquarters for training, reserve and Special Forces until its closure in 1991. 1996, Royal Marines Band Service Bugler – Deal (65p).The Royal Marines Band Service play for ceremonial and state occasions, major concerts and other events. The bands are the public face of the Royal Marines in their distinctive white helmets and blue uniforms. The Bugler is shown in front of the Barracks at Deal, home of the Royal Marines School of Music from 1930 – 1996, where the students, mostly school leavers joining at 16, were trained to be musicians and battlefield medics. Tragically in 1989 the Royal Marines School of Music at Deal became a target for the Provisional IRA. Each year the Royal Marines Band from Portsmouth visit the memorial bandstand in Deal to pay their respects to those who died in the bombing. 2014, Royal Marines Commando (£1). Internationally renowned, the Royal Marines are the UK's Commando force and the Royal Navy's amphibious troops. They are held at a very high readiness to respond to events around the globe.